Bulldogs enter as contenders in MVC; Maranacook could see big improvement. 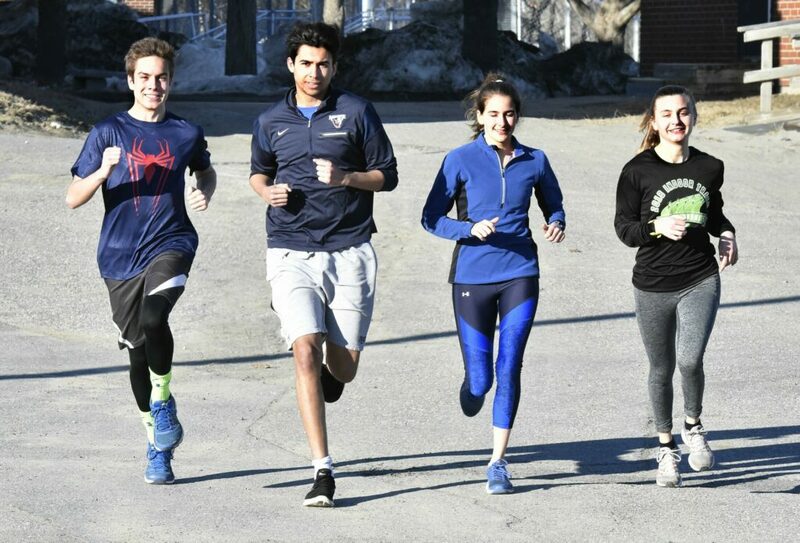 The short spring track season in Maine belies the intensity required to succeed. If recent success is a good indicator then a few central Maine teams should be in the running for conference titles. There are also several returning individual state champions who hope to replicate past performances. Hall-Dale returns two individual state champions from a team that finished second in the Mountain Valley Conference meet and 10th in the Class C meet. The building blocks include seniors Matt Albert and Ashtyn Abbott. Albert won Class C javelin and MVC long jump titles while Abbott is the defending state champ in the high jump. The Bulldogs have a number of events covered with juniors Owen Bean and Adam Scovil and senior Anthony Romano. Senior Alixx Canwell leads the throwers while Mason Darveau specializes in the pole vault and mile. Richmond is counting on several newcomers, many of them upper classmen, to round out the events. Much like Hall-Dale, Monmouth returns a solid core. The Mustangs finished third in the MVC meet and return some talented performers in seniors Even Burnell and Kyle Gunnells, as well as junior Gabe Martin. Monmouth enjoyed a strong turnout this season and expects to fill most of the events with quality athletes. Maranacook competes in the Kennebec Valley Athletic Conference against Class A and B teams but the Black Bears are in Class C and expect to make an improvement at both meets based on 10 returning seniors. “With a highly talented and motivated group of seniors and potential to achieve a major jump in the standings is high.” coach Ronn Gifford said. Winthrop brings back five experienced veterans, but participation is down and the Ramblers will need to rely on individual rather that team success. Madison and Carrabec fielded a combined team a year ago but have gone back to separate squads this season. Both are dealing with fairly low turnouts. Tyler Peters and Reid Campbell each qualified for the state meet a year ago and lead Madison while Austin Garland returns a Carrabec team of eight boys. Mt. Abram returns its 4×100 state qualifying relay team intact while Richmond continues to build momentum under coach Jeff Orth, now in his fourth season. Cony lost several point scorers who helped the Rams to a second-place finish in the Kennebec Valley Athletic Conference meet and an 11th place showing at the state meet. Coach Jon Millett hopes those losses are offset by the influx of new talented athletes as well as improvement of his veterans. Seniors Caleb Richardson and Nathaniel Berry lead the returning group for the Rams and there are exciting newcomers led by junior Simon McCormick, one of the school’s top athletes. “He brought some of his friends with him,” said Millett, referring to sophomore Dakota Dearborn and junior Logan Butler. All three are sprinters, along with senior Hussein Albraihi, who comes back after a year away from the team. Winslow lost several scorers from a team that finished third in the KVAC meet a year ago but returns a state qualifier in distance runner Nick Tiner. Erskine brings back a solid experienced group that fully expects to improve on last season’s sixth-place finish at the conference meet. All-around senior Jack Jowett sets the tempo for the Eagles. “He could probably qualify in any of 12 events,” coach David Currier said. Lawrence fields a team of 27 boys that’s heavy on throwers and middle distance runners but looking for sprinters. Senior Matt Glidden, who finished second in the high jump at the state meet, leads a Maine Central Institute team that is otherwise young. Participation is down at Mt. Blue but as usual the Cougars feature a number of quality middle distance and distance runners. Nokomis has several strong athletes led by sprinter Chance Graves. The Warriors also field a strong 4×400 relay team. Former Winslow standout Katie Souviney takes over as head coach at Waterville and is looking for seniors Ethan Nurick and Nick Dall to set the pace. At Mount View, coach Kevin Petrak has a good group around which to build while Gardiner continues to build its program under third-year coach Jen Boudreau. Messalonskee hopes to open its new track April 25th at its first home meet and the following month will host the Community Cup for a gathering of central Maine teams. The Eagles have made do with a cinder track and have participated in all their meets on the road. “It’s the first time ever we’ve had a facility of our own,” coach Matt Holman said. The boys have just a few returning veterans but there are several freshmen on the squad, perhaps a reflection of having a new facility. Skowhegan hopes Cutter Warger, who is recovering from knee surgery, can return to form during the season. Along with fellow returning junior Andrew Ireland, the team features some good athletes.